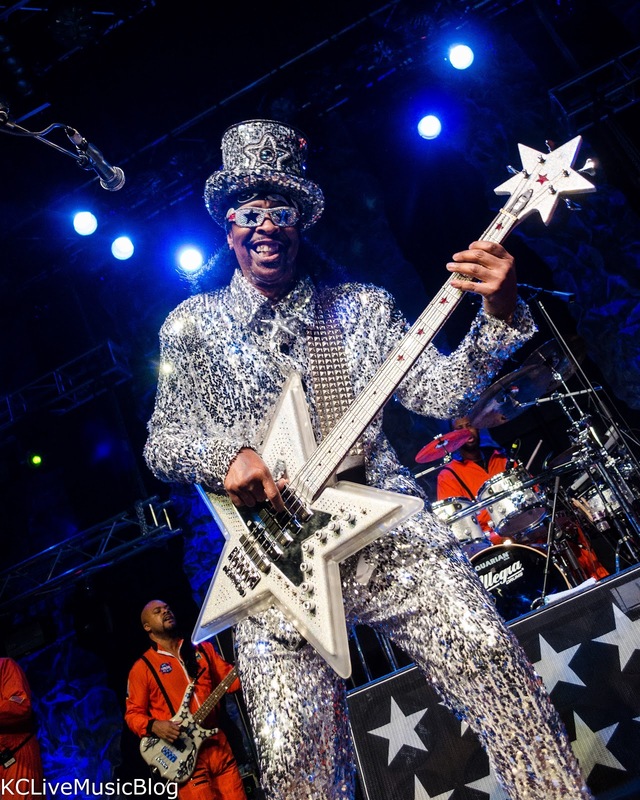 Bootsy Collins comes by the nickname Star Child honestly. He plays a light-up star-shaped bass, is famous for his star sunglasses and has a personality so radiant he could be nothing but a star. But it has also been many moons since the R&B pioneer and right-hand-man in George Clinton’s Parliament-Funkadelic empire has been to town. Before Collins took the stage Saturday at VooDoo Lounge, his MC announced the last time the band was in Kansas City it played a funk festival at Arrowhead Stadium. If true, that would have been in the late 1970s. Collins made up for lost time, opening with a torrential 20-minute medley of both solo and P-Funk classics. Snippets of “Hollywood Squares,” “Mothership Connection” and “Dr. Funkenstein” had the entire house dancing. Although he would perform some complete numbers, most of the night was basically a medley of his best-known songs and choruses. The two-hour set only slowed down once, for the ballad “I’d Rather Be With You.” Even then, Collins slipped a few bars of “What’s a Telephone Number” and “I Just Called to Say I Love You.” It’s incredible this hit was selected from all of Stevie Wonder’s considerable contributions to funk. It’s even more remarkable that Collins and his band made it work. Several members of the 10-piece unit have played together for decades. Vocalist Mudbone Cooper and keyboard player Razor Sharp Johnson date to the original Rubber Band from the ’70s. Collins was a little too generous in sharing the spotlight. He left the stage for tributes to friends Bobby Womack and Buddy Miles, a cover of Dee-Lite’s hit “Groove Is in the Heart,” on which he originally played bass, and, oddly, Parliament’s “Flashlight.” The performances were fine, but Collins was missed. His personality is huge, and just him being onstage pushed the energy up a couple notches. Every time Collins left the stage he returned in a different outfit. The best was the mirror-ball tuxedo and top hat he wore to open the show, and the red-sequined Casper the Friendly Ghost gown he debuted last. During “Tear the Roof off the Sucker,” a couple of bandmates helped Collins remove the ghost gown to reveal a Chiefs jersey of Alex Smith underneath. Dressed as if he were ready to return to Arrowhead, Collins jumped into the crowd and spent about 10 minutes hugging fans, shaking hands and posing for selfies as the band roared on. Setlist: Bootsy? (What’s the Name of this Town) > PsychoticBumpSchool > Hollywood Squares > Mothership Connection > Dr. Funkenstein, Groove Is in the Heart, Don’t Take My Funk, Body Slam > Funk (Making Something out of Nothing), I’d Rather Be With You (including What’s a Telephone Number, I Just Called to Say I Love You), Them Changes, Flashlight, Stretchin’ Out (In a Rubber Band) > Funk (Making Something out of Nothing) > Tear the Roof off the Sucker > Touch Somebody > Aqua Boogie > One Nation (Under a Groove).